Cooking 4 all Seasons: Microwaved Quick Mango Chunda! Mango Chunda was something I got to taste during the Gurathi Food festival we had at office. One of my colleagues, was a gujju and he said this is their prized dish. We had Masala puri as one of the items and this is what they decided on. When we asked him to share some of their stored stuff, he got some very reluctantly, thinking we might waste. He needn't have worried, the bowl was clean licked off! I was most taken in by it and always wanted to try at home. When I choose Bottled as the theme for this month's Microwave Easy cooking, I was hoping that I will get around making some of those book marked preserves. 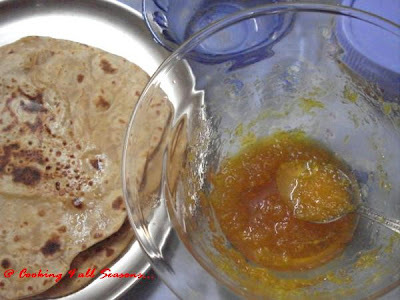 I had a Mango chunda recipe on hand. But it was with stove top reference. I knew it should take more than 5 mins to get it done. But I was still hesitating to handle it. Last week was the busiest one in terms of cooking something new and clicking it for the blog. But my obsession for this would never cease! When I happened to chat with Divya, she said she has a Mango chunda made in mw. I said I have been thinking of making just that, only I was thinking of the timing. so she mailed back the recipe with the MW process. Yeah, the recipe was the same but the timings, my god the one on stove top says it takes about 40 - 50 mins, working on the sugar and mango. Infact Divya's recipe calls it to be soaking in for 5 mins, I skipped and just mixed sugar with Mango and kept it inside. It was just too simple to make in Microwave! Imagine by the traditional way, the whole family is involved in mixing the sugar and heating over the pan on a stove top! After making it and enjoying it with Roti, I felt I was really glad that I did this in microwave as this I feel is the real benefit of cooking in Microwave. Grate Mango and mix turmeric to it. Then mix the sugar to the Mangoes and in a MW safe glass, keep it for 2 mins. Open and stir well. Then keep for 3 mins. 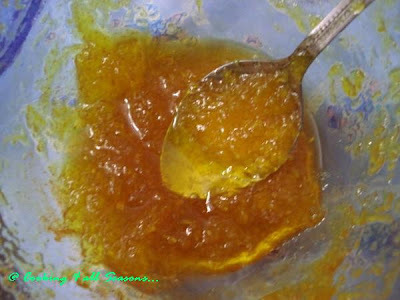 The sugar is all well melted and mixed, The consistency should be of one thread, when you test it. Then mix the chili powder and jeera powder. Mix well and let it rest for 5 mins. Enjoy with rotis or as such. This is my entry for my Microwave Easy Cooking, this month themed on dishes that can be bottled! This I heard stays good for a year. But I am sure if I make this, it won't be around for so long! We had been to Tiruchendur on a day trip and came back this morning. I got many mails from friends and readers saying they heard there was a slight tremor in Madras. Since we were not at home, I asked Athamma about it. She said she didn't feel anything. So it must've been very slight, thank God for that! Thank you all for your concerns. I am feel very honored to have your friendship! Will be back with pictures we took in Tiruchendur. Have a great Sunday!